Fourteen years ago, Bantay Kalikasan saw a neglected La Mesa Watershed which fell prey to the illegal settlers who cut trees for commercial trade. Being the sole watershed in Metro Manila which provides potable water to its 12 million residents, Bantay Kalikasan launched the Save the La Mesa Watershed campaign . “To let go of the remaining watershed in Metro Manila would be totally unacceptable. It is only by working together to save the “lungs of the metropolis” we can guarantee a good future”, said AFI Managing Director, Gina Lopez. With full enthusiasm, the partnership between MWSS and Quezon City Government and BK was forged to reforest the entire watershed. From a once decrepit-looking land, it is today an award winning haven where a variety of birds and species thrive. It is now among the most visited public park in the city by families, students and was even identified as a favorite location for pre-nuptial pictorials. A total of 620,800 trees were planted in La Mesa Watershed, covering 98.3% of its 2,700 hectares, helping clean the polluted air of the metropolis. 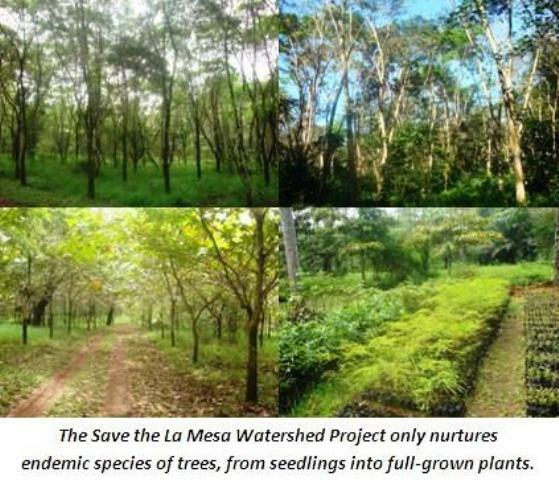 The La Mesa Ecopark was opened to the public to provide funds to sustain the watershed. It is seen as a long-term endeavor that can help guarantee the financial sustainability of the reforestation efforts. Bantay Kalikasan established healthy business venture with MWSS and QC Government to carry out the conviction that it is vital to save the environment through ecotourism – sustainable, no irreversible damage and has long-term benefits for future generations. Through private organizations and individuals who believe this conviction, Bantay Kalikasan was able to raise Php101 Million for the rehabilitation of La Mesa Watershed and Php247 Million to develop Ecopark. A management fee (equivalent to 15% of the gross revenue generated from the park operations ) is ploughed back by AFI in the form of park employee’s salaries, upkeep and maintenance and improvement of amenities. The remaining balance is used to restore the watershed. Should there be a remainder or unutilized funds, these will be remitted to MWSS and QC Government. Bantay Kalikasan presents a financial statement to the board annually. An Environmental Trust Fund from the operation of the La Mesa Resort Zone held in trust by AFI for all the parties are intact and well-documented. Bantay Kalikasan has maintained a very good working relationship with MWSS and Quezon City Government in the last 14 years. The gains of having been able to save a forest, bring about security in the water supply of the city, provide clean air and a place for recreation for millions of city residents is a success that is shared by all. “Let us be reminded that the water we drink comes from La Mesa Watershed. Our source of potable water was once at risk. It is because of this campaign that we are guaranteed of clean water in Metro Manila. ,” Gina Lopez enthused. Bantay Kalikasan commits to remain a catalyst to provide a sustainable and natural environment for future generations. We enjoin everyone to support this advocacy. For inquiries, call Bantay Kalikasan at 4152227 or La Mesa Ecopark at 4305208 or 4304051. Visit www.bantaykalikasan.com. Like our Facebook pagewww.facebook.com/abscbnfoundationkapamilya.